The International Food Policy Research Institute (IFPRI) has published an atlas illustrating the current state of African smallholder agriculture. The Atlas of African Agriculture Research and Development comprises a series of maps and short analyses that showcase and locate the continent’s diverse agricultural challenges and opportunities. Seven topics are covered: political, demographic, and institutional classifications; the footprints of agriculture; growing conditions on the continent; the role of water in African agriculture; drivers of change in African agriculture; access to agricultural trade; and human welfare. In briefs facing each map, the Atlas answers four questions: What are these maps telling us? Why is this important? What about the underlying data? Where can I learn more? By presenting a broad range of geospatial data and explanatory text, the analysts hope the Atlas will serve as a reliable and up-to-date guide for informed decision-making, which can help speed, broaden and sustain Africa’s agricultural productivity. What is this map telling us? 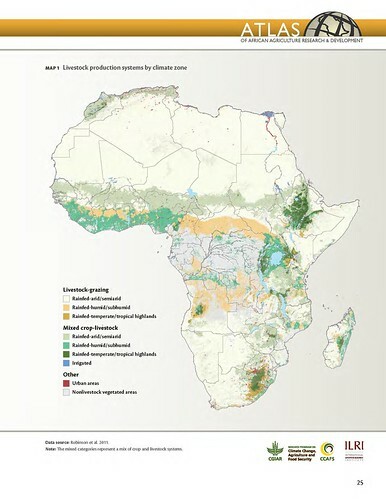 Livestock-producing agricultural systems cover 73 percent of Africa and stretch across several climates (Map 1). To some extent, these climates determine what type of farming is practiced. In Africa, livestock-producing systems are broken into two main categories: livestock and mixed crop-livestock. These systems exist in three common African climates: arid/semiarid, humid/subhumid, and temperate/tropical highlands. Livestock systems are most prevalent on grazing lands in arid climates that cover large swaths of Africa. Mixed crop-livestock farming systems are either rainfed or irrigated. Rainfed systems are much more common (although areas of Sudan and Egypt have important irrigated mixed systems that present different opportunities and constraints). There are many mixed crop-livestock systems throughout western Africa, eastern Africa, and parts of southern Africa. The Congo Basin, in central Africa, is mostly forest, with some savanna and cropland at its outer edges. As a result, the Basin is home to a small number of livestock systems relative to the rest of the continent and only a smattering of mixed crop-livestock systems. Many studies have found the influences of crop and livestock production vary considerably, not only regionally but also according to production system (Robinson et al. 2011). Globally, but particularly in Africa and Asia, crops and livestock are often interdependent and influence farmer households and livelihoods in a number of ways. Detailed knowledge of crop and livestock systems and their distribution allows researchers to measure impacts on everything from the environment to livestock disease risk. For example, viewing the livestock density by type and region helps researchers measure the level of environmental impact. Classification of agricultural systems can also provide a framework for predicting the evolution of the agricultural sector in response to changing demography and associated shifts in food demand, land use (for example, competition for land from food, feed, and biofuel production), and climate. Production of 30-plus maps covering the 7 topics took more than 5 years of work and the collaboration of many experts and organizations, including the Australian Centre for International Agricultural Research (ACIAR) and the UN Food and Agriculture Organization (FAO) on Africa’s diverse farming systems; McGill University on the extent of crop- and pasturelands; HarvestChoice and IFPRI on agroecological zones; and Welt Hunger Hilfe, Concern Worldwide and IFPRI on the severity of hunger. Tags: IFPRI, Philip Thornton. Bookmark the permalink.